Turkish Presidency did not give an appointment to U.S. Syria Special Envoy James Jeffrey. Instead, he was received by Defence Minister Hulusi Akar. Jeffrey, who was supposed to hold talks with the spokesman of Turkish Presidency on creating a buffer zone, following the U.S. troop withdrawal decision, could not get an appointment. In an explanation made by the Turkish Minister of Foreign Affairs Mevlüt Çavuşoğlu on Jan 24 that U.S. special envoy would have talks with Presidential Speaker İbrahim Kalın and Turkish Deputy Foreign Minister Sedat Önal. According to the information, taken from presidential sources, Kalın did not give an appointment to Jeffry. 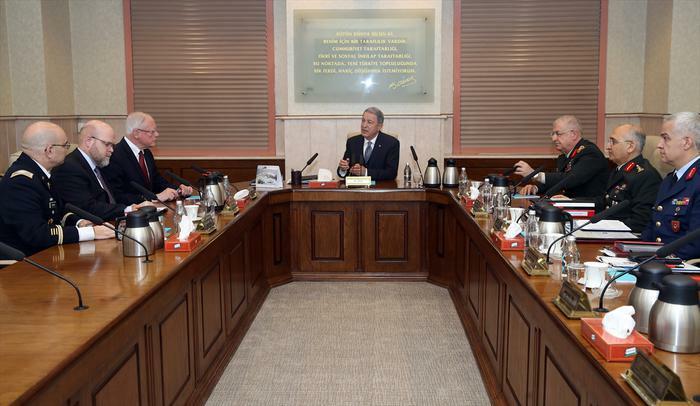 Previously, Jeffrey held talks with Turkish National Defence Minister Hulusi Akar. During talks with Jeffry, Akar conveyed Turkey’s determination on terminating U.S. relations with YPG/PKK terror organisations, Turkey’s expectations on urgent completion of the Manbij Road Map, Turkey’s sensitiveness on the territorial integrity of Syria, and his opinions on solutions which can be reached through dialogue between the two countries. The two countries have some divergence both in regional and international issues. While the U.S. strictly opposes possible Turkish military intervention in Syria, Turkey insists on the intervention to eliminate the presence of Kurdish PKK and YPG forces, which Ankara considers as a terrorist organisation. Turkey and the U.S. are at odds on the YPG presence which is not considered as a terrorist organisation by the U.S., while Turkey sees YPG as an offshoot of the PKK which is waging a three-decade war against Turkey to establish an independent Kurdish state both in Turkey’s Eastern and South Eastern Anatolian region. In the meantime, in his 25 January speech President Erdoğan spoke about Syria and said Turkey expects a “safe zone” against ISIL and YPG- Kurdish armed groups in Syria- to be set up within a few months, otherwise it will establish the zone by itself. But the U.S. is strictly opposing a buffer zone to prevent possible damage on Kurdish people living in Syria. Meanwhile, U.S. talks with Turkey about a safe zone in Syria intensified before and after the visit of Turkish leader Recep Tayyip Erdogan to Moscow. Following a visit by U.S. Republican Senator Lindsey Graham to Ankara last weekend and a call between U.S. President Donald Trump and Mr Erdogan on Sunday, Secretary of State Mike Pompeo followed up with another phone conversation last Monday with Turkish Foreign Minister Mevlut Cavusoglu. Washington reiterated its commitment to address Turkish security concerns along the Turkey-Syria border while emphasising the importance of imposing the protection of forces that worked with the U.S. and the Global Coalition to Defeat ISIS.